Plant description: Groot Zevert has a state-of-the-art digested and treats yearly about 100 000 ton of pig manure. Groot Zevert is located in a region where farmers are in an urgent need to find sustainable solutions for their surplus of manure produced which cannot be applied on land nearby due to the excess of minerals available in their region (mainly P surplus and partly N surplus). Current manure disposal practices are unsustainable considering the fact that huge volumes of manure (water and organic matter) are transported over large distances (couple of hundreds km) to regions with demand of nutrients. 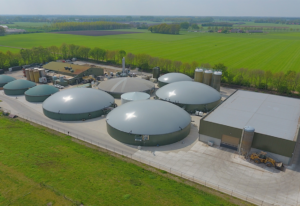 Innovation: Pig slurry will be processed in such way that only the surplus of available minerals is recovered from the manure in a mineral form. Phosphorus will be recovered from the solid fraction of manure as calcium phosphate by means of an innovative new P stripping technology which has been intensively tested on different scales. Nitrogen will be recovered from the liquid fraction of the manure. ICL will perform test with the recovered materials to (i) define minimal product criteria and (ii) to adjust their production process. Products & Benefits: The nutrient-depleted manure can be applied as an organic soil improve in the nearby region without exceeding P- and N-application limits. The recovered calcium-phosphate and ammonia sulphate can be used by the fertiliser industries as secondary resource to produce high-grade mineral phosphate and nitrogen fertiliser.